Few American Presidents have been called to lead the nation through as times as trying as those faced by Franklin Delano Roosevelt. Elected to the Nation's highest office while the country was deep in the Great Depression, he was reelected as the clouds of fascism and war gathered over Europe. Perhaps as amazing as FDR's own accomplishments is the fact that his First Lady, Eleanor Roosevelt, made so many significant and lasting contributions of her own. Eleanor was actually a distant cousin of Franklin's. While her uncle, Theodore Roosevelt, was President, Eleanor and Franklin met at a White House reception, and immediately developed a great affection for one another. Although Franklin's mother, Sarah Delano Roosevelt, objected to the pairing, she did what she could to help Eleanor, who had been orphaned at the age of ten, to fulfill her role as chatelaine of a prestigious family. Both branches of the Roosevelt clan were born of privilege, but after her formal schooling Eleanor volunteered as a social worker in the East Side of New York. During their courtship, Eleanor showed Franklin the squalid tenement conditions, which had a lasting impact on the sheltered young man. After they were married, and early in Franklin's political career, he was struck down by a paralytic disease that robbed him of the use of his legs. It became necessary for Eleanor to take over many of his public appearances. Eleanor made time for her own causes, but Franklin often chided her for lacking the political skill of compromise. Once in the White House, Eleanor quickly began expanding the role of First Lady, assembling a staff of her own, holding regular press conferences (to which male correspondents were rarely invited, due to an under-representation of women in the press corp), and writing for a number of magazines. The brief collection presented here is a series of short programs carried by NBC under the sponsorship of Sweetheart Toilet Soap. The broadcasts were a regular Tuesday and Thursday feature before Roosevelt's second reelection campaign. Much less formal than the President's Fireside Chats, Mrs. Roosevelt's Own Program was intended to address "women's issues" and gave listeners a taste of life in the White House as well as the goings-on of the First Family. The marriage was not always a happy one, the couple was described as two strong willed people who cared for each other's happiness, but recognized that they couldn't provide it. During the War Eleanor became a very public face of the Administration, touring the battle zone of the Pacific (winning the admiration of Admiral "Bull" Halsey) and making a goodwill tour of Latin America. After FDR's death, President Truman appointed Eleanor as a delegate to the United Nations General Assembly, where she helped to draft the UN's Universal Declaration of Human Rights. Although she never sought elected office of her own, Eleanor Roosevelt remained active in public life nearly to the end of her life in 1962. Her funeral was attended by President Kennedy. She was laid to rest next to Franklin on the family compound in Hyde Park, NY. 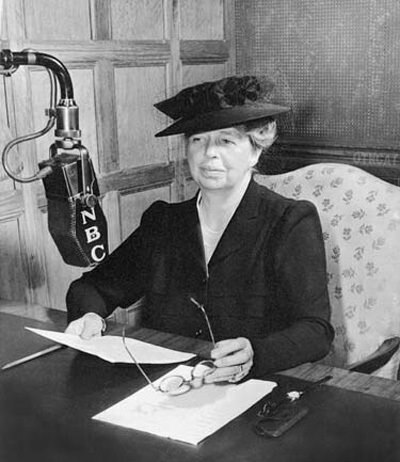 These recordings are in the larger Eleanor Roosevelt Recordings Collection. 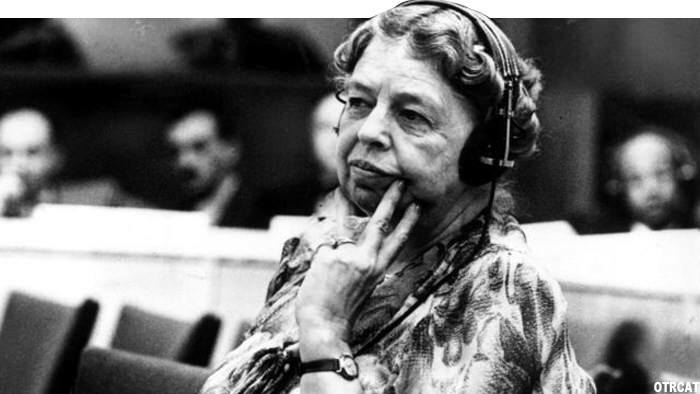 Be the first to comment on "Mrs Eleanor Roosevelt Own Program"